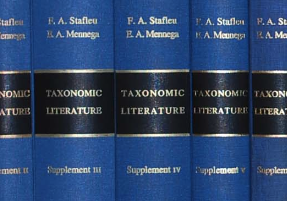 Taxonomic Literature: A selective guide to botanical publications and collections with dates, commentaries and types (Stafleu et al.). TL-2 is the premier publication of the International Association for Plant Taxonomy (IAPT) and this online version was made possible by the generous cooperation of the IAPT. In its print form, TL-2 is a 15 volume guide to the literature of systematic botany published between 1753 and 1940. It is organized by author and includes numbered entries for the author's publications. Suggested abbreviations for use in taxonomic publications are provided: abbreviations for the author's name, short titles and abbreviations of the short titles for publications. TL-2 is the standard by which authors' names and titles should be abbreviated. Currently, we offer a basic database searchable by keyword, author name, title number, author name abbreviation, or title abbreviation. We display the search results with the scanned page and the parallel OCRed and corrected text in a "page turning" application. The next round of planned improvements, to be done in conjunction with the redesign of the Smithsonian Libraries' website, is to implement Linked Open Data for the entire TL-2 dataset. This computer-friendly format will give each authors and publications a permanent, authoritative URI on the web. These URIs will contain information in both human-readable form (via HTML) and computer-readable form (via RDF/XML.) A SPARQL endpoint will also be provided for querying the linked data. Further in the future, we wish to perform additional parsing of the data to, for example, extract the Herbaria that contain specimens collected by the authors, link authors and publications to other sources on the web such as the Virtual International Authority File, the Biodiversity Heritage Library, and the Encyclopedia of Life. Funding for this online version by the Atherton Seidell Endowment Fund of the Smithsonian Institution.